With Sera Viformo feeding tablets you get a reliable complete food for your bottom-feeding fish, such as catfish or loach. The tablets provide your fish with all the important nutrients and contribute to their development and health for a long period of time. Growing catfish and other bottom feeders require specialist fish food, which is tailored to their needs and feeding habits. It should provide them with all eΒential nutrients and take their natural feeding behaviour into account. 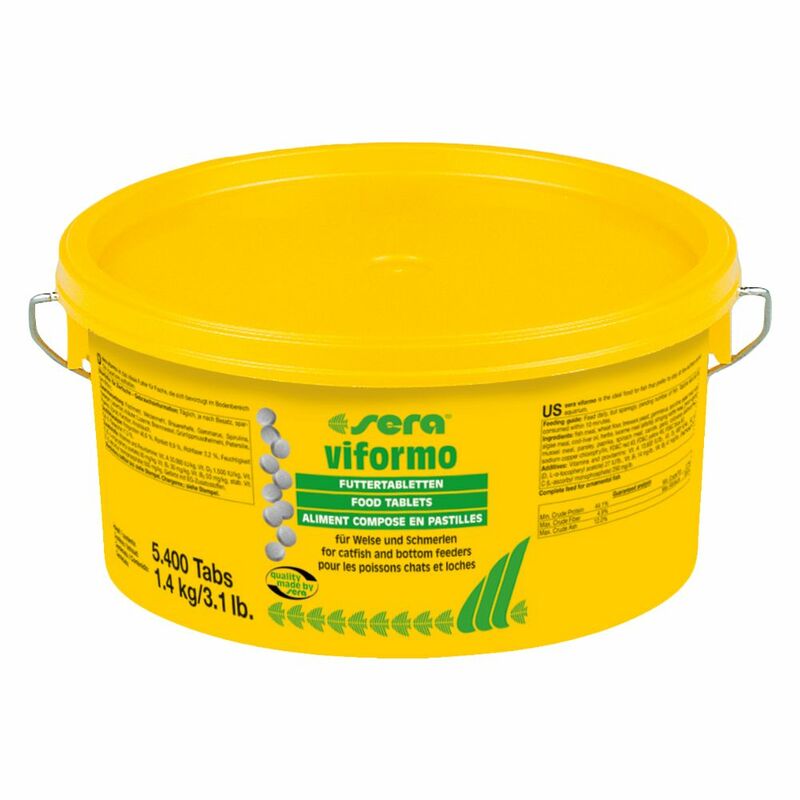 The complete food from Sera Viformo are carefully prepared into bite-sized tablets that retain their shape in water and are highly accepted by catfish, loach and other bottom feeders. As the tablets do not diΒolve in water, you don't have to worry about your tank getting cloudy and ultimately result in reduced algae growth. Sera Viformo tablets contain prebiotic Mannan-Oligosaccharides (MOS), which strengthen the immune system. The balanced composition helps promotes the growth and health of your pet fish. Sera's recipe is based on a healthy mix of herbal ingredients, with secondary ingredients designed to make your fish's colours more vibrant. Added omega-fatty acids, vitamins, minerals, proteins and other ingredients that are specifically tailored to the needs of your fish. Sera Viformo at a glance: Complete food for catfish, loach and other bottom feeders Optimal nutrient composition: thanks to balanced ingredients Enriched with gammarus shrimp and seaweed With prebiotic Mannan-Oligosaccharides (MOS): for a strengthened immune system Compact tablets: bite-sized and designed to diΒolve in the mouth No water clouding: from the breakdown of tablets Promotes growth and health of your fish Very high acceptance Low water contamination: resulting in reduced algae growth Lowers risk of infection Reliable complete fish food from Germany.